Atheist inmate gets $2 million for being sent back to Jail for refusing religious drug rehab. 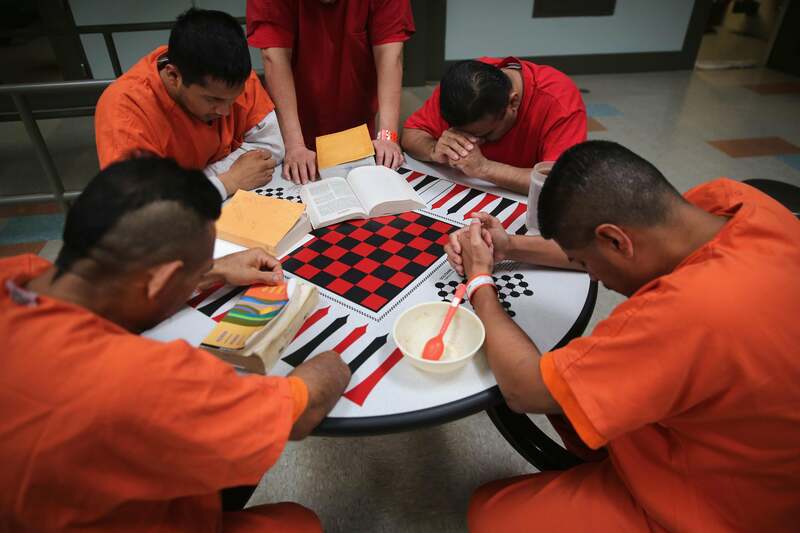 Detainees pray during a prayer group at the Adelanto Detention Facility in California. A California inmate—ordered to spend 90 days in a residential drug treatment center after serving a year in jail for meth possession—refused to enroll in the program because it required he pray to a “higher power.” Barry Hazle, a lifelong atheist, was sent back to prison for 100 days for noncompliance. That was in 2007. This week, “[s]even years and two federal court rulings later, he and his lawyers announced a $1.95 million settlement Tuesday of a suit against the state and its contractor, WestCare California, for wrongful incarceration in violation of his religious liberty,” the San Francisco Chronicle reports. When [Hazle] arrived, officials told him it was a 12-step program, modeled on Alcoholics Anonymous, that required participants to confess their powerlessness and submit to a “higher power” through prayer… [Hazle] had asked for a secular treatment program. He said he was told this was the only state-approved facility in Shasta County, where he lived, but that it wasn’t a stickler for compliance. “They told me, ‘Anything can be your higher power. Fake it till you make it,’” he recalled. Hazle refused and was declared in violation of parole and sent back to prison for 100 days. A federal judge in Sacramento ruled in 2010 that the state had violated Hazle’s rights by revoking his parole and returning him to prison. A jury declined to award damages, but last year the Ninth U.S. Circuit Court of Appeals said Hazle was entitled to some financial compensation for his “loss of liberty” and ordered a retrial. The court also said WestCare was potentially liable for referring Hazle to a religiously based program. All those claims were resolved by Tuesday’s settlement.